Liberal weenies inside the beltway have thrown every block they can at President Trump’s border wall. Specifically, they have denied him funding for the wall. There are, however, patriots at work searching out creative ways to pay for the wall. 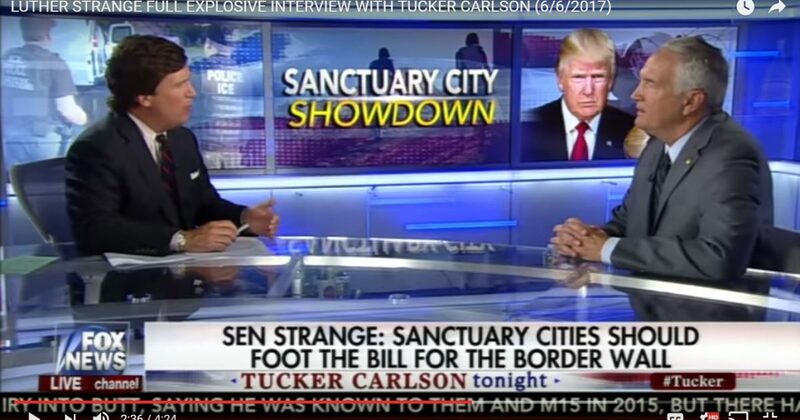 Check out Alabama Senator Luther Strange’s idea, forcing sanctuary cities to fund the wall. Great idea!…. Senator Luther Strange (R-Alabama) and David Perdue (R-Georgia) introduced the Securing the Border and Protecting Our Communities Act. The bill would prohibit certain Federal Transportation Grant Funds from being made available to sanctuary jurisdictions that refuse to cooperate with the Department of Justice in upholding immigration laws or who penalize local businesses for bidding to work on the border wall. Funds not directed to these cities would be reallocated for use under the Secure Fence Act of 2006 toward the completion of the wall, according to Alabama Political Reporter. Last month, California state lawmakers advanced a measure to prohibit the state from awarding contracts to any company involved in the wall’s construction. Similar measures have been introduced or considered in New York, Rhode Island, and San Francisco. The city of Berkley, California adopted a “black list” to cut off any funds to companies or contractors that want to assist with the building of the border wall. In his budget proposal, President Donald J. Trump (R) proposed taking $210 million from sanctuary cities who participate in a US Justice Department program used to reimburse jailers for the cost of housing criminal illegal aliens. Trump would then use those dollars within the Justice Department to hire 75 more immigrations judges raising the total to 449 to deal with the backlog of immigration cases. Trump would also hire sixty more Federal Immigration Law Prosecutors and forty more Federal Marshals to hunt down and apprehend violators of US immigration laws. Senator Strange was appointed to the Senate by former Alabama Governor Robert Bentley (R) after the Senate seat was vacated by Sen. Jeff Sessions (R) to become US Attorney General. Strange is running for the seat in this year’s Special Election. The Special Primary Elections is August 15, and the Special General Election will be December 12. Strange is a former Alabama Attorney General.